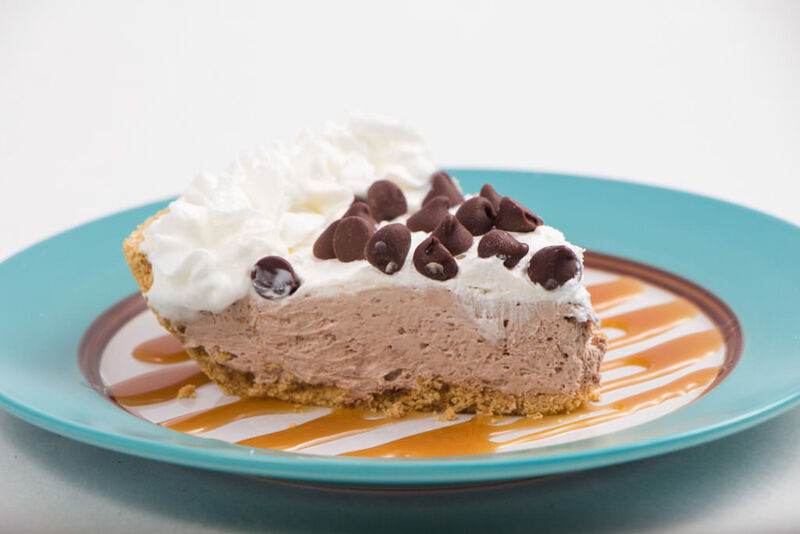 Hershey’s Chocolate Symphony Pie has to be the easiest pie to whip up. Take it to work, for have it with the family. The reactions will all be “Wow! That’s good!”. 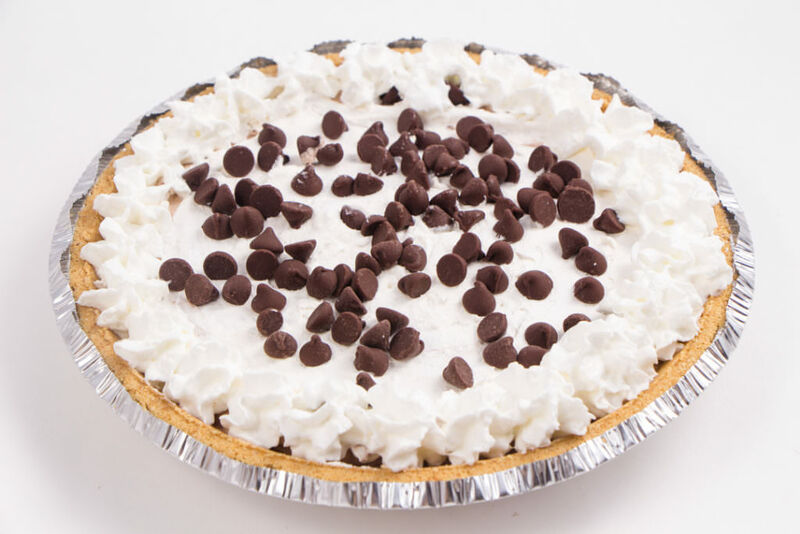 Try Chocolate Symphony Pie, and see for yourself. No Bake Pies are simple put, No Bake! 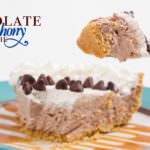 This 3 ingredient Chocolate Symphony Pie has been a favorite and even voted as a favorite pie recipe at work by my co-workers. Which is why I keep these ingredients on hand to whip up one of these pies when ever needed. How to Make Symphony Pie Recipe? You won’t believe this, but this pie is a great pie to teach those who might be hesitant to be in the kitchen. This Symphony Pie Recipe is fool proof! Break up your kingsize Symphony bar into small pieces into a microwave safe bowl. Heat for 30 seconds and stir. Then another 15 seconds and stir and repeat. Don’t over cook. It will be lumpy because of the toffee bits in this candy bar. That’s okay! Add 4-5 cups of water to your Instant Pot and place a larger glass bowl on top of your pot. Set to Saute’. The water will heat up and create steam. The steam will heat the glass bowl and gently melt the chocolate in the bowl. 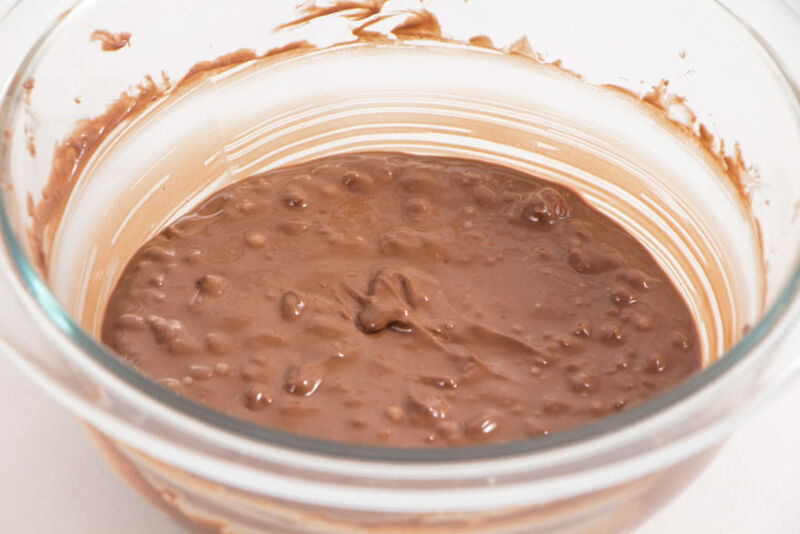 With a spatula, stir the chocolate until melted. Never burn your chocolate again! I have to admit, when I told my son I was making this pie he said “Mom, that’s hardly a recipe”… I laughed! He is right. This is hardly a recipe and that is what is so great about it. Can I use other Hershey Candy Bars? 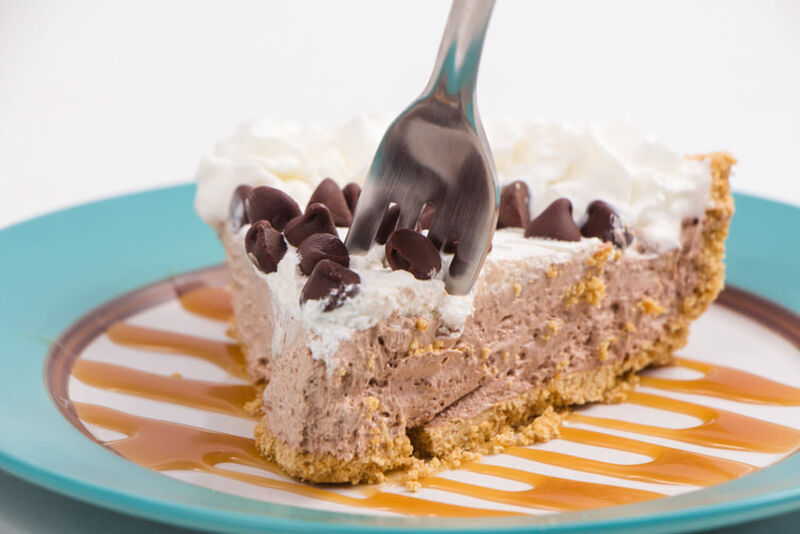 This recipe for Chocolate Symphony Pie can be made with ANY king size candy bar. Use your favorite and you will love it even more. Try a Mr. Goodbar, or Baby Ruth. What about Kit Kat? Oh Yum! The possibilities are ENDLESS, so make sure try them all! What does Hershey Symphony Bar Pie Taste Like? I’ve had many people eat this Chocolate Hershey Symphony Bar Pie with me and their reaction has all been the same. “Wow, that is really good!”. This pie is creamy with a light texture and a gram cracker crust. I’ll take that as a compliment for sure and be grateful I didn’t spend all day in the kitchen. 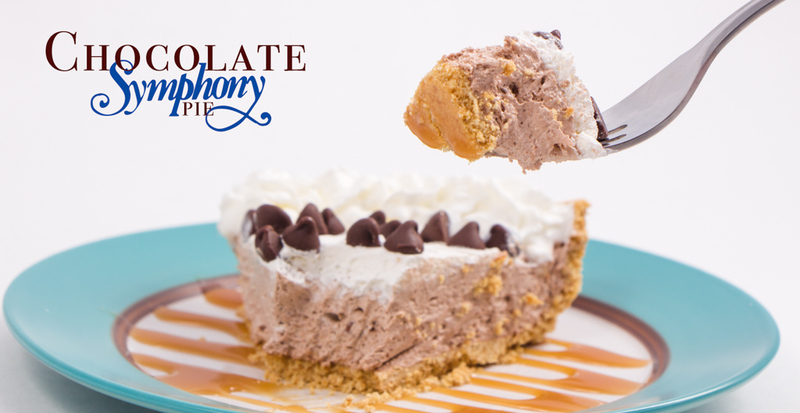 Thank you Hershey’s for making such a scrumptious Symphony bar so I can make a pie with it! 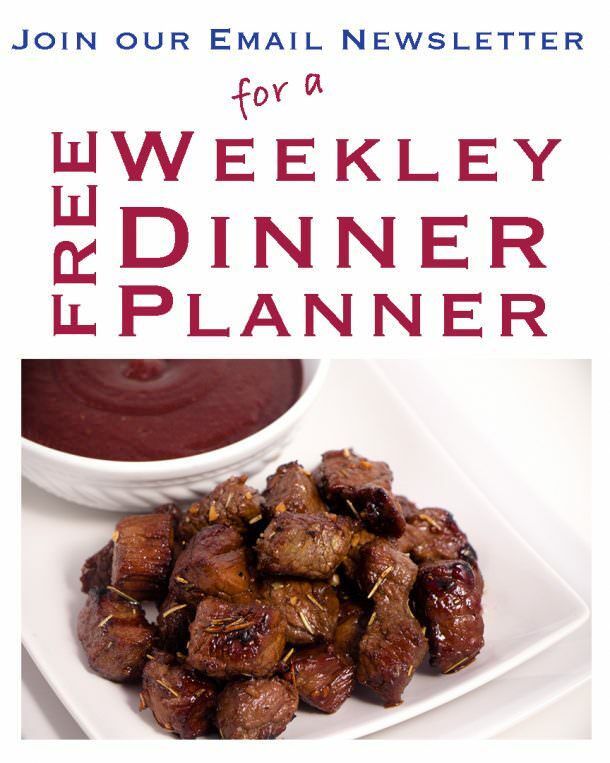 You know you want to make this again and again so PIN and SAVE for Later! Wait, there are MORE great Pie Recipes we have to offer! Check them out! This scrumptious pie is made with 3 simple ingredients. 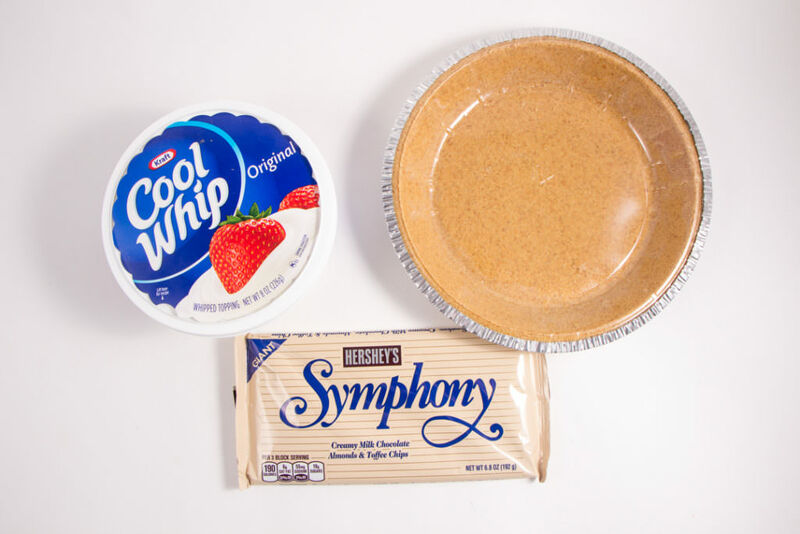 Hershey’s Symphony Bar, Cool-Whip, and a Gramcracker crust. Don’t let the lack of ingredients fool you. This pie is wonderful. In a microwave safe bowl, break up symphony bar into smaller pieces and melt in microwave. I prefer to only cook it for 30 seconds or less and then stir. You don’t want ot burn the chocolate. 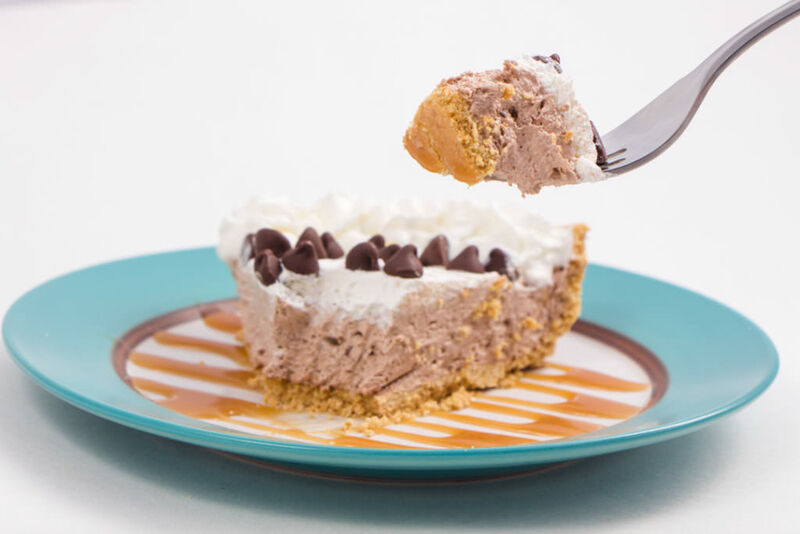 Pour into prepared gram cracker pie crust. Place in Freezer for 2 hours to set up. Remove from freezer 15 minutes prior to serving. I forgot about pi day! That is one thing I love about pies, they don’t have to be super complex. This looks so easy and my hubby loves candy bars. You are right Brittany. Pies don’t have to be complex to be great! This looks so good! I love that it also looks easy to make. SO those 2 things make this a perfect dessert. What a fun and easy treat to make! Yum!! Love me some chocolate pies. Looks delicious. This looks so good! I love chocolate pies.